It’s a crisp November morning, the day before families and friends will gather for food and the sharing of gratitude on Thanksgiving. 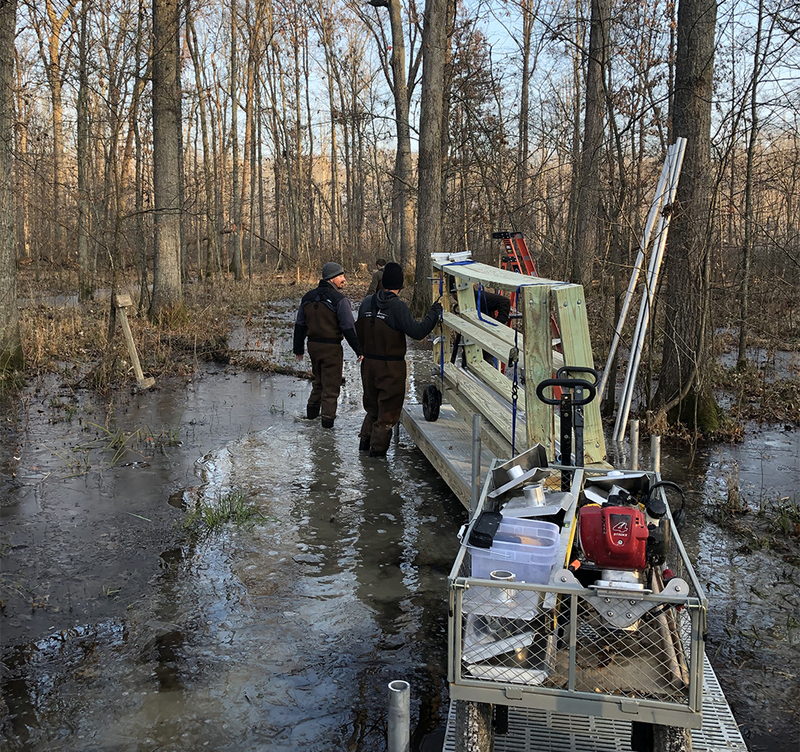 While many folks are firing up the oven for a day of preparation, a small crew of workers at Beanblossom Bottoms Nature Preserve sips steaming coffee and puts on extra layers of wool socks before squeezing into their coverall waders. A thin layer of ice covers the murky, deep puddles that envelop the wetland preserve, thanks to autumn rainstorms. The team loads carts to carry heavy power tools and even heavier wooden frames nearly a mile out. They will be climbing up on precariously balanced ladders to drill long aluminum poles deep into the ground before installing the handmade frames and plastic decking material for the new boardwalk trail. One adventurous Communications Director has donned her old farming Carhartts to help out for the morning, but as she waits for the sun to rise and her toes to thaw, she silently questions her choice not to stay at the cozy office this morning. Spirits are high, though, and the crew of five sets out on the trail they have been building for two months, after working since July to deconstruct the front portion of the worn-out old wooden boardwalk. The massive scale of this project is unlike anything Sycamore has undertaken in such a concentrated time frame. But it’s evident while traversing the new plastic decking that those who envisioned this project and worked so hard to make it happen were right: this far safer, sturdier, and more accessible boardwalk will serve thousands of Beanblossom Bottoms visitors for years to come. Building on a legacy that started with some farmland nearly 20 years before. Most conservation stories start modestly. We draw inspiration and motivation from the ones that can grow into something as significant as the 1,500-acre Beanblossom Creek Conservation Area that Sycamore Land Trust protects, stewards, and strategically expands with new land acquisitions. Beanblossom Bottoms began as a 42-acre parcel of land donated by Barbara Restle in 1993. She had donated 87 acres of farmland to the adjacent Muscatatuck National Wildlife Refuge a few years before, the same year Sycamore Land Trust was founded by volunteers of the Sassafras Audubon Society and others. Barbara was inspired to protect this land she owned after learning that Westinghouse planned to build an incinerator in the Bloomington area and bury the coal ash on Bottom Road near her land. Beyond that threat, Barbara had seen a bald eagle flying over her land for years, and was dismayed to hear that a timber company had felled a large tree on a nearby farm which was home to an eagle’s nest. So she took action. Over lunch recently, Barbara expressed satisfaction that these two goals had been met by protecting her land with Sycamore and USFWS in the Beanblossom Creek Conservation Area. The PCB dumping never took place, and now there’s an active bald eagle nest that you can even see from the boardwalk. She explained that one month after September 11, 2001, school buses of students came to see the new eagle’s nest the birds had built in a tree on the now protected land. We’re honored to consider her one of Sycamore’s dear friends; this is why we named our highest annual honor the Barbara J. Restle Lifetime Conservation Award. For some of us, it’s hard to imagine Beanblossom Bottoms without the 1.5-mile wooden trail, three observation decks, half a dozen educational signs, and a bald eagle nest. But there was a time when much of it was farmland, many of the trees weren’t even four feet tall, and the boardwalk was just a dream in the minds of a few committed volunteers. John Gallman, a former president of Sycamore’s board of directors, spearheaded much of the boardwalk project and ongoing repairs over the years. But he’s quite humble about his contribution, and quick to emphasize how moved he was by the great numbers of people willing to help all along the way. “One of the reasons I pushed for the trail was that at the time, Sycamore had almost no public access sites,” John told me over coffee. “It was important to me that we do something for the public, since encouraging access to nature was and is an important part of our mission.” We were chatting in the living room of the beautiful Cedar Crest house, Sycamore’s office since the Caldwell family donated it in 2007. When John was president in the 2000s, Sycamore’s staff of one parttime employee and a host of volunteers were working out of a small donated office space downtown. Every marker of this organization’s progress is thanks to the generosity and hard work of donors and volunteers! 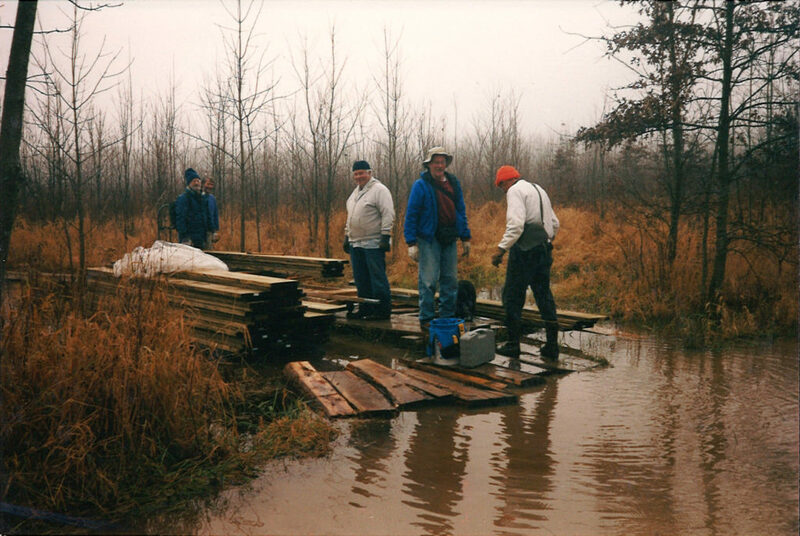 In 2005, after much planning and on a tight budget, a dedicated crew of volunteers would gather every Saturday to build the original boardwalk. Duke Energy gave a major grant in 2006 to help pay for materials for the original environmental education trail, and when Lenore Tedesco from the Laura Hare Charitable Trust heard about this project, she reached out and asked how they could help. The Trust helped fund much of the rebuild when a major portion of the boardwalk was picked up and moved 20 feet off course in the 100-year flood of 2008. Both organizations have continued their generosity in many ways, including a new grant from the Duke Energy Foundation for the trail rebuild. The built trail made an otherwise untraversable swampy forest an inviting place to witness the dance of the woodcocks, look for frogs and spiders at night, and breathe in the fresh air of the great outdoors. The Nina Mason Pulliam Charitable Trust is the primary funder for rebuild project, awarding a grant of $250,000. Over the years, the Trust has enabled Sycamore to expand our impact by providing funding to hire several key staff positions. The trustees believed so strongly in this latest endeavor because it increases access for those with limited mobility. David Hillman, Program Director for the Trust, told me: “The land Sycamore protects provides habitat for endangered wildlife. That’s vitally important because your properties are accessible to the public, so visitors can interact not just with the preserve itself but everything that’s in it.” Nature can be therapeutic, he notes, and all people can benefit from visiting the beautiful, wild places Sycamore protects. Working behind the scenes takes just as much dedication and foresight, and we owe our gratitude to Christian Freitag and John Lawrence for their years of hard work preparing Sycamore for this complicated venture. Development Director Ann Connors worked diligently to raise the hundreds of thousands of dollars needed to complete our most expensive project to date. 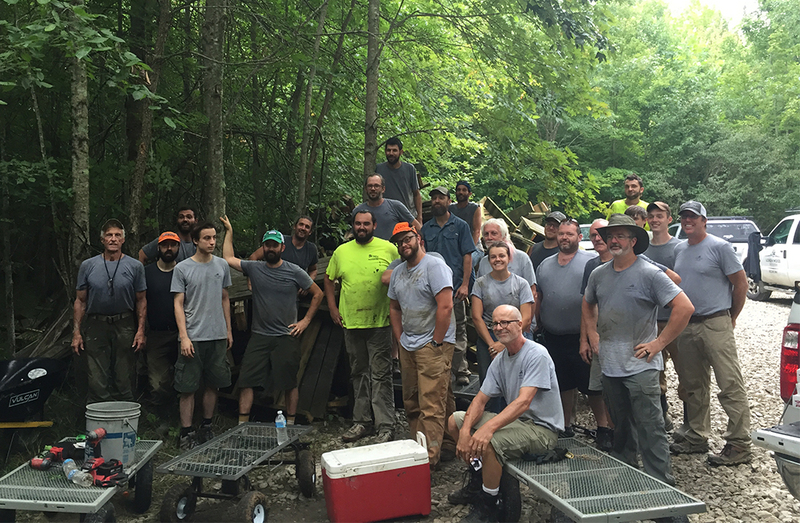 A big crew from Loren Wood Builders helped to tear out the old boardwalk trail last summer. Contractor and major Sycamore supporter Loren Wood calls the rebuild “a labor of love.” When he was brought into this project in the early planning stages, everyone expected to tear it out in the spring and then rebuild in the dry summer and fall. That dry season never came, he says, and workers have faced every kind of challenging weather. But he thanks Chris Fox and David Stewart, lead carpenter for Loren Wood Builders, for their unwavering leadership and infectious enthusiasm. He admires the pride they take in their work. 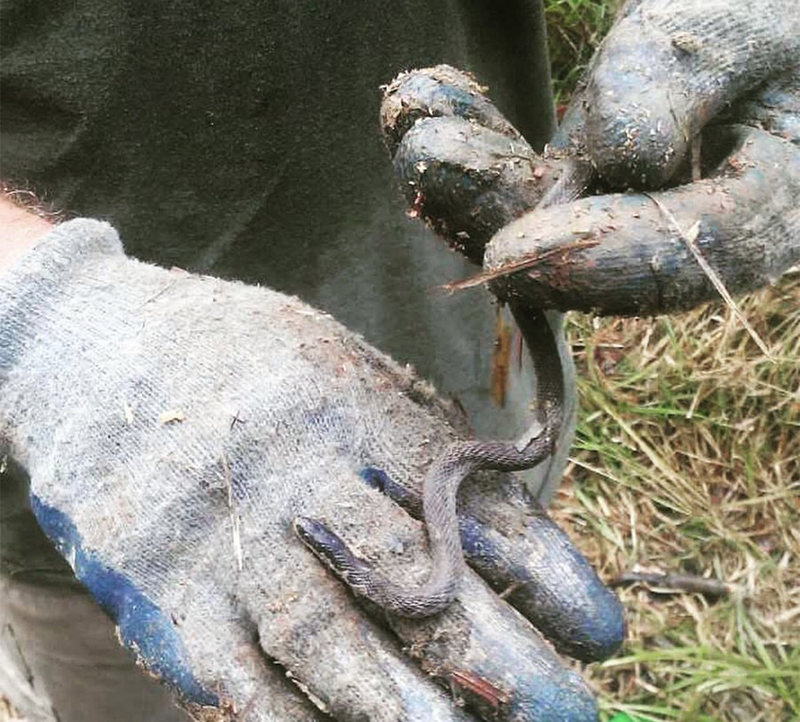 Workers were careful not to disturb habitat, including that of this little state-endangered Kirtland’s snake. We’re proud of the impact Beanblossom Bottoms has had on so many people over the years. But perhaps the truest beneficiaries are the plants, animals, fungi, and thousands of water-dwelling species that have found refuge in this most remarkable landscape. 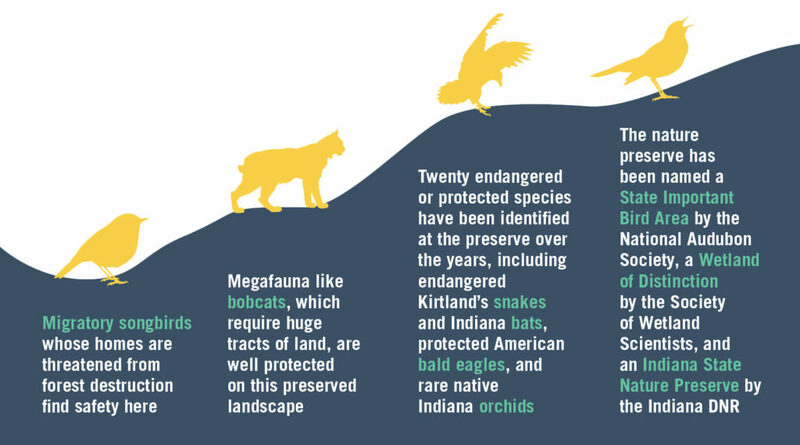 Wetlands are enormously productive ecosystems, home to greater biodiversity than Indiana’s other types of habitats. As we continue to steward the land by removing invasive plants and planting wetland-hardy trees, and acquiring additional land to be protected, there’s a steady increase in climate benefits like trapping carbon emissions and filtering runoff. 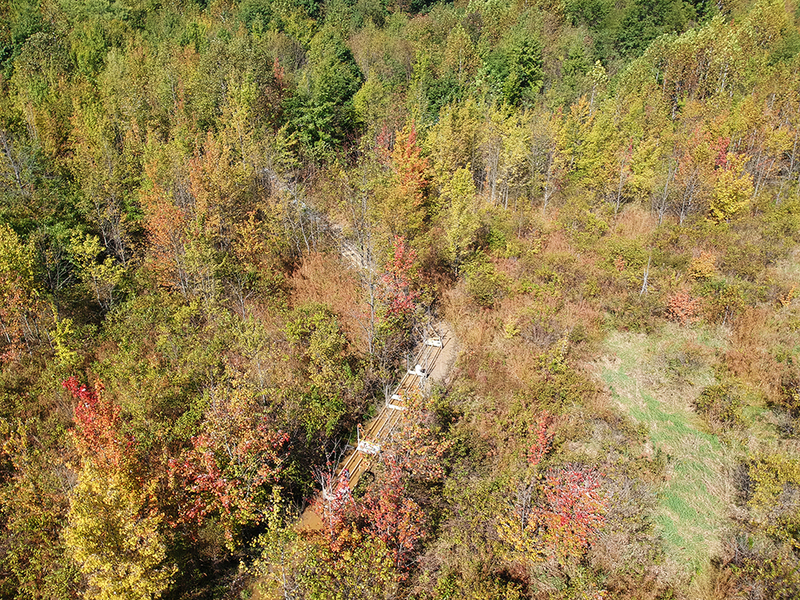 With the support of Sycamore donors and volunteers, Beanblossom Bottoms Nature Preserve will continue to flourish and expand, and we have yet to see the full ecological impacts of the investments we’re making today. Thanks to the Sycamore community, this land will be protected and stewarded forever, and all of us can visit and enjoy its beauty.